dunkin_bookstore has no other items for sale. Are you KIDDING me. Super fast delivery. Got the book today, 4/1/2019. I am so much impressed with this product. I got it early than the expected date. Haven't read it yet but Fast shipping & A+++++++ Seller Thanks!!! Did not receive book in timely manner. Til this day I have not received my book. Love this book! It's hard to put down! Michelle is an excellent writer, and it keeps you wanting to read more. She is so honest, and I learned so much about this wonderful woman and her family. I HIGHLY recommend this book! Someone told me that this would be a great book for my daughter who is African-American. She loves it and has shared it with all her friends, black and white. 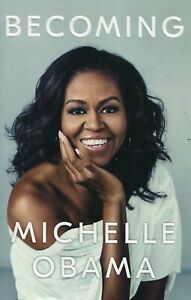 This book is inspiring to all young women! Very well written and very interesting. She has an excellent style. Did get tired of seeing address of her childhood home.